Plus a complimentary download of MobileMark 2018 available upon release. The Professional edition also includes a 1-Year Subscription Service, downloads to all updates & releases commencing on the release date of MobileMark 2018. The Professional edition also includes a 1-Year Subscription Service, downloads to all updates & releases commencing on the release date of SYSmark 2018 or MobileMark 2018. Operating System: Microsoft® Windows®8 64-bit and Microsoft® Windows® 7 64-bit. The OS languages listed below will support MobileMark 2014 provided the OS Regional Language settings are set to US English & Chinese (Simplified). Responsiveness. The Responsiveness scenario models usages where the ability of the system to react quickly to the user’s input impacts the experience of using the system (i.e. – user’s want to feel like the system responds smoothly and quickly). Some workloads include: application launches, file launches, web browsing with multiple tabs, multi-tasking, file copying, photo manipulation, file encryption and compression, and background application installation. Responsiveness Scenario Workload Description. Launch a variety of creativity and productivity applications. Browse a large number of web sites. Import photos into a catalog. Export a large set of photos from a catalog. Decompress the encrypted and unencrypted archive files. Copy a large number of files in the background. Save presentation documents. Install and uninstall applications in the background. Switch between various web browser tabs. Save a variety of documents to the file system. Switch between various applications. Energy Consumption Measurement. With the purchase of a supported power meter, SYSmark 2014 SE now offers users the ability to measure energy consumption over the course of a benchmark run. This provides an easy-to-use tool allowing small businesses, corporations and government organizations to factor energy consumption into their internal total cost of ownership procurement calculations. The new Energy Consumption feature records energy usage in watt-hours during the workloads. 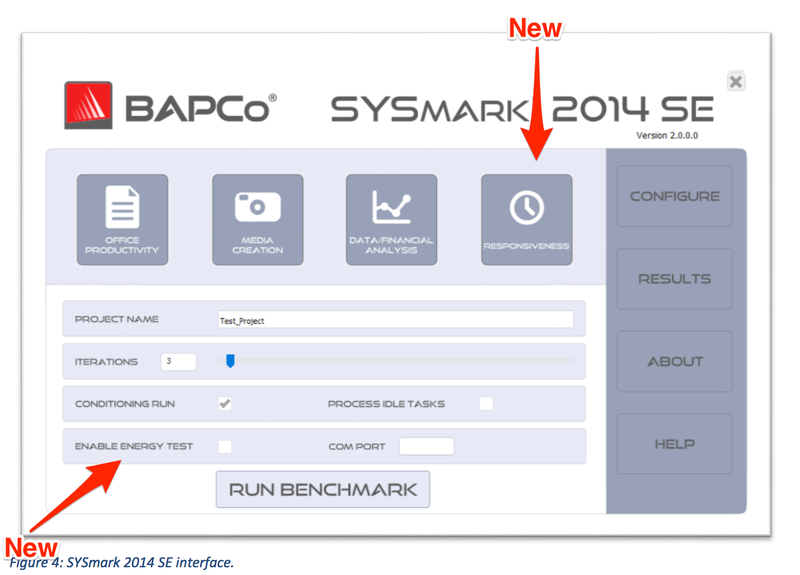 Download and/or boxed versions of SYSmark 2014 1.5 & MobileMark 2014 1.5. In addition versions of SYSmark 2014 & MobileMark 2014 are included for legacy requirements. Available in 64-bit, 32-bit or both 64 & 32-bit versions. BAPCo’s EEcoMark v2 supports both 64 and 32-bit versions of Windows® 7, Windows® Vista® with SP2 and Windows® XP (Professional and Home) with Service Pack 3.